South Africa has regained the title of Africa's largest economy, two years after Nigeria rebased its GDP to claim the spot, according to IMF data. But BBC Africa Business Report editor Matthew Davies says both economies could be on the brink of recession. On the basis of these numbers, there's not a lot between the two. 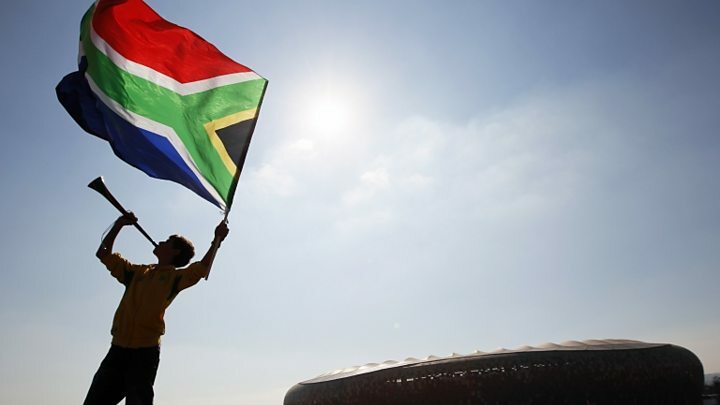 South Africa's economy is worth around $301bn (£232bn) and Nigeria comes in at $296bn. But look behind the league table and the light-hearted jostling about who has the largest economy in Africa and things, economically speaking, are a little bleaker. Both economies contracted in the first quarter. Another contraction and they'll both be in recession. Nigeria is almost entirely dependent on its oil exports. And as the price of oil slumps so does the flow of petrodollars coming into the country's coffers. South Africa's economy is more diverse. Indeed, after Nigeria knocked it off the top spot two years ago, we started describing it as "Africa's most industrialised economy", rather than Africa second-largest economy. But economic growth is unlikely to make it above 1% in South Africa this year and many, including the country's Reserve Bank, are forecasting it at zero. Unemployment remains stubbornly high and a credit rating review is looming at the end of the year. If the whole "largest economy in Africa" competition was a horse race, the two leading contenders would be virtually neck and neck. But they wouldn't be galloping, they'd be trotting at best. And looking increasingly tired and in need of sustenance.